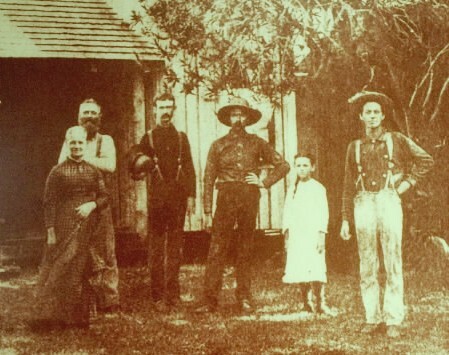 In the early 1900s, Boynton pioneer families lived in frame vernacular homes. Horace Bentley Murray, who built the Boynton Hotel for Michigan investor Maj. Nathan S. Boynton, constructed many of the wood houses, commercial buildings and swing bridges. The majority of these early structures became lost to time with progress, fire and hurricanes claiming them over the last 120 years. Today’s “Andrew’s House” at 306 SE 1st Avenue is Boynton’s oldest residence. Bert L. Kapp, a Dutchman who moved to Boynton from Michigan built the house in 1907. Although the house is typically thought of as constructed in 1901, newspaper records support a 1907 construction date. The Kapp family sold the house to A.E. Parker, Major Nathan S. Boynton’s son-in-law, and moved to West Palm Beach. Charles Lee Andrews and Katie Andrews purchased the house from Parker. The Andrews’ story is intriguing. Charles Lee Andrews served in the Confederate Army under the name Benjamin F. Green. He married Katie in Mississippi, in spite of the fact that he was at least 42 years older than Katie. They had two sons, George Kermit and Charles Lee Jr. The Andrews ran a small grocery store in Boynton. Charles Lee Andrews passed away in 1922, and Katie remained in the house. She began collecting Andrew’s Civil War pension. 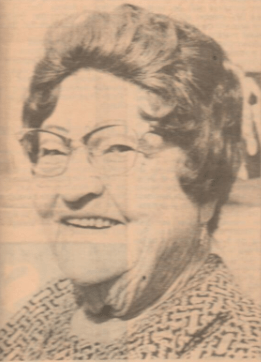 She continued to collect that pension until 1971, when she passed away, making her the last Civil War pensioner in Palm Beach County. Her son George and wife Edith then lived in the house; George passed away in 1993. Edith moved to a nearby apartment, and the house was boarded up and fell into disrepair. In 1998, Boynton native Bob Katz bought the Andrews house and several other downtown properties. He had the Andrews house moved to an adjacent lot so it could be better seen from Ocean Avenue, and had the house restored. Katz’s untimely death at age 50 in 2006 has left all his downtown properties in limbo, and several are currently for sale. House: Fish scale shingles to gables, wood shake roof, brackets, exposed rafters, dormer window. In reading through old books, newspapers and pioneer accounts, once in a while a name would pop up that intrigued me – Cecil Upton. Various accounts of Cecil described him as eccentric Englishman who bought land in the area that would become Boynton, and that he came from a very wealthy family. With those intriguing clues, the search began for the elusive Englishman of Boynton. Mr. Upton first appears in a book describing the accomplishments of various Upton family members. Upton was from Long Eaton in Derbyshire, born in 1849, son of William Judd Eaton, a well educated clerk with bachelors and masters degrees to his credit. Cecil too was educated at Oxford. But the great opening of America called Upton, and he emigrated in 1873. Somehow, he made his way to wilds of Florida and bought 40 acres from the State of Florida near Deland on January 4, 1876. Somewhere on his Florida trip, Upton became acquainted with Mason Dwight. 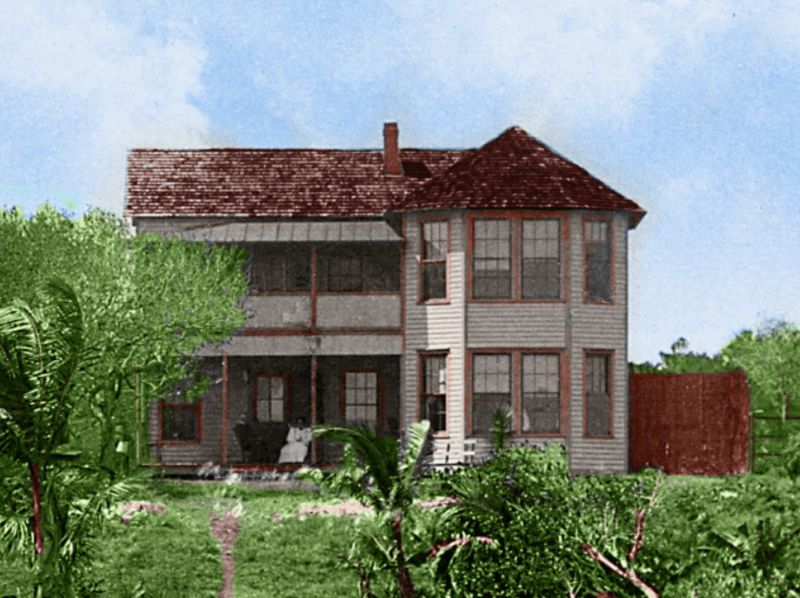 Dwight and his family had been some of the very first settlers on Lake Worth, in fact building what could be considered the first true house on Lake Worth, with wood, windows and fixtures brought from Jacksonville, but with a palmetto thatched roof. Life was just too difficult, so Dwight had left his nephew in charge of the Lake Worth homestead while the family had moved further north. Pierce then states that Upton bought some land at the land office in Gainesville on his way back to Louisiana, where he was teaching in a Black school. Upton did not buy any land at that time. He did buy 40 acres in 1880, 82 acres in 1881 and 90 acres in 1888, all located north of present day downtown Boynton along what would become the Federal highway and railroad, stretching to Lake Worth waterway (Intracoastal). He also appears on the 1880 Census as living in Louisiana, a single man teaching school. So he sat on those 200 acres in Florida, paying the taxes and selling a few small parcels here and there. Somewhere around 1910, Upton appears to have retired to Boynton to finally live on the land he had bought 30 years prior. When he first had the land, he had planted many tropical trees including coconuts, mango, bananas and pineapple. He was on the 1910 Census in Boynton, and listed his occupation as “farmer.” By 1920, his business interests were changing, and he purchased the original Scotia Plantation house owned by John Brown and opened “Upton’s Chicken Dinners.” It was only briefly open, and eventually became a “roadhouse” where liquor was sold during prohibition. Upton increasingly became a recluse. Rumors began to circulate that Upton was very wealthy, receiving regular payments from his rich sister in England. In celebration of Hispanic Heritage month, a recent discovery about Major Nathan S. Boynton, for whom the city of Boynton Beach was named, can be brought to light. Recently I was helping a friend with some research on her family history, and I thought it might be interesting to see if I could find some more information on Major Boynton, who founded and owned the Boynton Hotel on the beach. I first found Major Boynton on the 1860 census, living near Cincinnati, Ohio. He was 23 and listed his profession as “Physician.” I had read he intended to study medicine after working in the grocery business (“mercantile”) for a few years. As the Civil War broke out, he returned to Michigan and enlisted in the cavalry. He rose in rank to Major, and mustered out in 1865, relocating to Marine City, Michigan. In the meantime, he married and started a family. On the 1870 census, he is listed as being an “editor” with wife Annie in the household along with children Charles, Annie, George and Frances. Major Nathan S. Boynton (center, seated) and his family. He had purchased the local newspaper and served as editor. I did not find an 1880 census record for the family, and the 1890 census is pretty much gone, lost in a fire. It was the 1900 census that presented some interesting information. Census forms changed over the years; one of the changes was the requirement to list the place of birth of the parents of each of the persons in the census. And in Major Boynton’s line on the census, place of birth for his mother was listed as Spain. I knew that Major Boynton’s wife was from Germany, but I had never heard his mother was born in Spain. A bit of looking found a biography of Major Boynton and it listed his mother as Frances Rendt Boynton, daughter of “Old Captain Lewis Rendt.” In looking at Captain Rendt, his actual name was Johann Ludwig Rendt, and he was born in 1773 in Germany. He was a Hessian soldier who had served in the British army. The British would “lease” entire battalions of Hessian soldiers to join their side in various conflicts; Captain Rendt had fought for the British in the war of 1812 against the United States. As part of his payment, he was granted land in the province of Ontario, very near the Michigan border. He married Joaquina Josephina Sophia Arliano from Cadiz, Spain and together they had eight children, born in Spain, Malta, and Canada. Among them was Frances Margaret Rendt, Major Boynton’s mother. She married Granville F. Boynton in Port Huron, Michigan. Granville died in 1845, and Frances remarried, to a Jonathan Graves. They had two sons together, who were half brothers to Major Boynton. Friday, January 22, 6:30 p.m.
Monday, February 22, 6:30 p.m.
Wednesday, March 23, 7:30 p.m.
Thursday, April 21, 7:30 p.m.
Friday, May 20, 7:30 p.m.
Thursday, January 12, 6:30 p.m. Sponsored by the City of West Palm Beach – Historic Preservation Program and the Parks and Recreation Division. 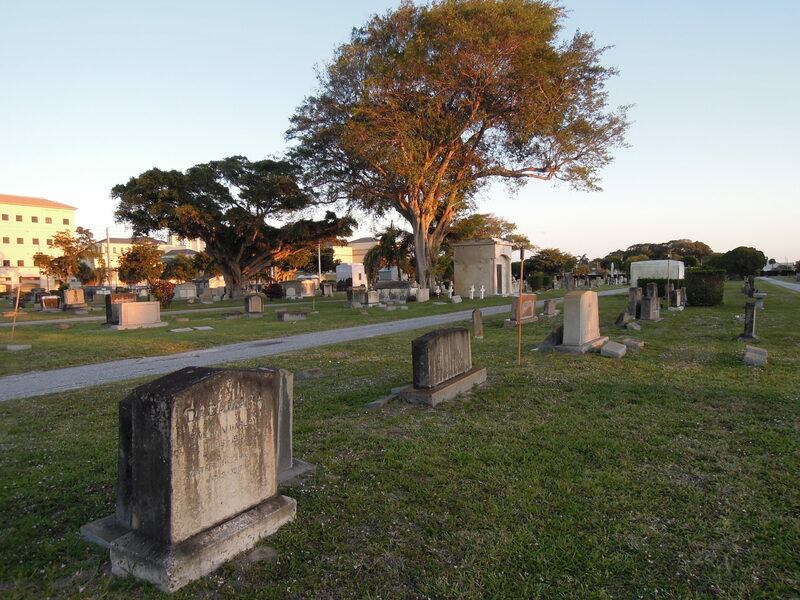 Look for more cemetery tours for Delray, Boynton Boca Raton & Lantana cemeteries coming soon! These award-winning history tours are limited to 50 guests, and a $5.00 donation is appreciated and will be used to help restore this historic cemetery. The tour will cover some of the most prominent pioneer families who arrived in the area more than 100 years ago. Along with a couple dozen other interesting pioneers, Charlie Pierce, Florida’s famous barefoot mailman and Boynton’s first postmaster is featured along with Anna and Albert Parker, Maj. Nathan S. Boynton’s daughter and son-in-law. Mr. Parker managed the Boynton Hotel. Several of South Florida’s barefoot mailmen. Charles “Charlie” Pierce on the right. To make reservations, please call 561-804-4900 (Francene). PLEASE BRING: A flashlight, bug repellent, water (there are no facilities on-site). PLEASE WEAR: Closed-toed shoes such as sneakers. LOCATION: 1500 South Dixie Highway, across from the Norton Gallery. Parking is available on-site inside cemetery gates. ALL TOURS BEGIN AT 6:30 PM or 7:30 PM dependent upon daylight savings time. PLEASE ARRIVE AT LEAST 15 MINUTES EARLY FOR CHECK-IN. Rain Policy: If heavy rain occurs on the night scheduled, the tour will be held the following evening. If it rains on the next night also, the tours is suspended for that month. 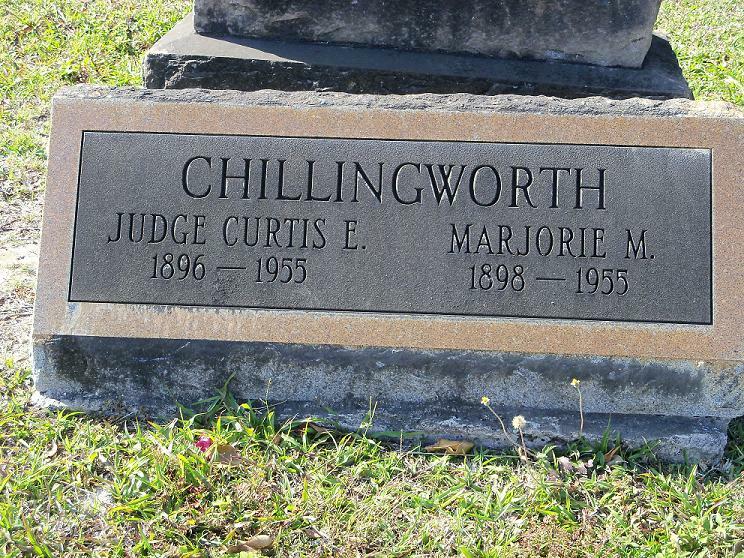 In the great adventure that has been the story of Byrd Spilman Dewey and husband Fred S. Dewey, who filed the plat for the Town of Boynton in 1898, a few mysteries remained, nagging for an answer. We had wonderful photographs of the grand house they built in West Palm Beach called Ben Trovato (meaning “well invented” in Italian), but we knew there was another Ben Trovato, and that home stood somewhere in Boynton. We didn’t know where the house was, nor how it looked. Not one person living in Boynton today had any recollection of the house. That was our only clue as to the house’s location and how it looked. 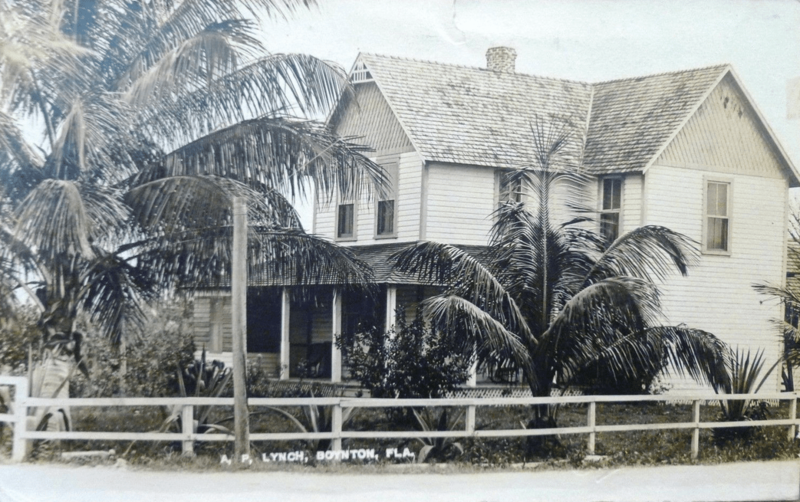 We combed through old pictures of Boynton from books, pamphlets, historical society newsletters, and other archival collections, but none seemed to match the location and the description. In July, a postcard with a lovely frame vernacular Boynton house owned by A.P. Lynch appeared on the eBay auction website. We checked land records and noted that the Deweys had sold their seven-acre citrus grove to Mr. Lynch in 1912. The Lynch house was two-story, but located on the east side of Federal highway at the corner of Ocean Avenue and Federal. 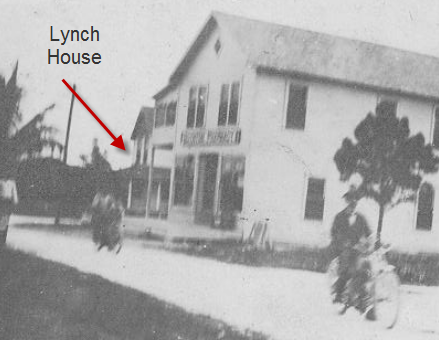 We saw the Lynch house noted on the well-known 1910 “Boomer” map of Boynton, and a portion of the house is visible on an old snapshot from Cindy Lyman Jamison. 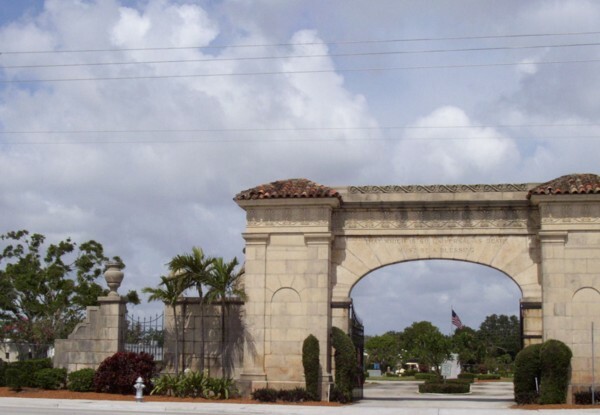 In August we pulled all the lot sales records from the original Town of Boynton at the Palm Beach County Courthouse for careful inspection of the lot buyer’s names and lot locations. We found that in 1912, the Deweys sold lots 1 through 5 in Block 1 of the original Town of Boynton to Charles T. Harper, which according to Mrs. Chadwell, is where the Dewey house stood. This information would also coincide with the year Mr. Dewey reentered the Soldier’s hospital in Johnson City, Tennessee and the Deweys left Boynton. Harper and wife Cora Stickney Harper would have lived in the house until they moved to Fort Pierce in 1913 when Charles was transferred to the Florida East Coast Railway station as head agent. In 1923, Charles sold the five lots to the Austin family. The 1924 Sanborn Fire Insurance map shows no structures on lots 1 and 2, where the house had stood. It could be that the house had burned down by the time the map was drawn. This supports Mrs. Chadwell’s report of the house burning down in about 1920. Without further evidence we were left with only the probable location, and no idea what the house was like, other than it was two-story. Then something very strange happened. Last week I was searching through the old Florida East Coast Homeseeker magazine, which was a sales tool for selling off Henry Flagler’s vast land holdings he had gained from the state of Florida for building the railroad. Several copies of this publication are scanned online in the HathiTrust archive, and once in a while I like to scroll through the pages and clip old photographs of areas long since developed. As I was looking through the Homeseeker late one evening, Janet DeVries texted me about the Dewey house – would we ever really know what it looked like – could it be the Lynch house after all? I answered back that I doubted we could ever know what it looked like. I continued to scroll through the Homeseeker issue, which featured the Everglades drainage project. Some interesting pictures of dredges and such, then a picture of a Delray house with a wooden cistern that looked like a scene from the 1960s television show Petticoat Junction. Then I scrolled to the next page—and saw a rather imposing two-story house in the woods—and the words “Ben Travato” [sic] sprang out from the page…and Dewey…and Boynton. It was as if I was guided to that page, that one page among the millions of books scanned online and their billions of pages, the one page that had a picture of the Dewey house in Boynton, at the exact moment we wanted to solve that mystery. The photograph is not sharp, having been scanned from the original lithographed magazine page. The photographer was listed as the “Florida Photographic Concern” and “Fort Pierce.” The company was based in Fort Pierce and run by Harry Hill, who was a bee-keeper and avid photographer. 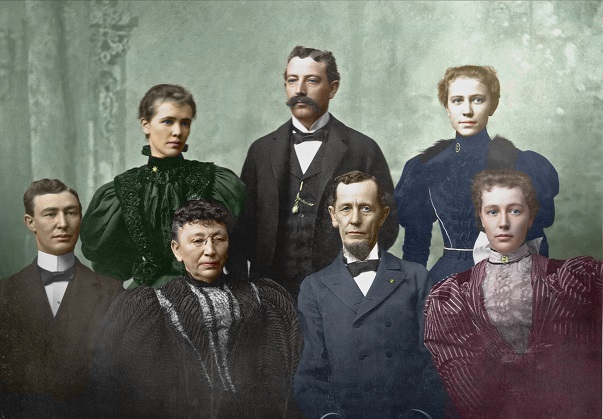 Many of his glass negatives have been preserved by the St. Lucie County Regional History Center; we contacted them to see if an original photograph exists in their archives. 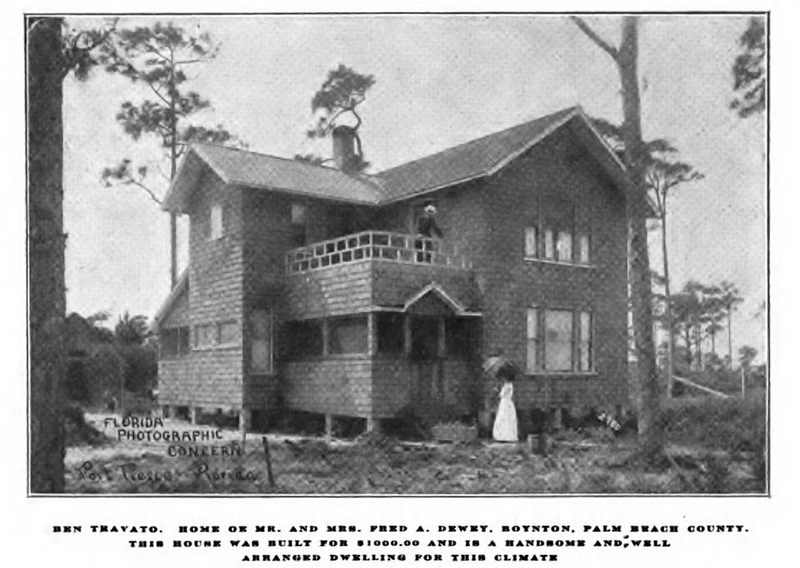 Hill did much photography for Flagler’s businesses, so he was probably hired to photograph the Dewey house. 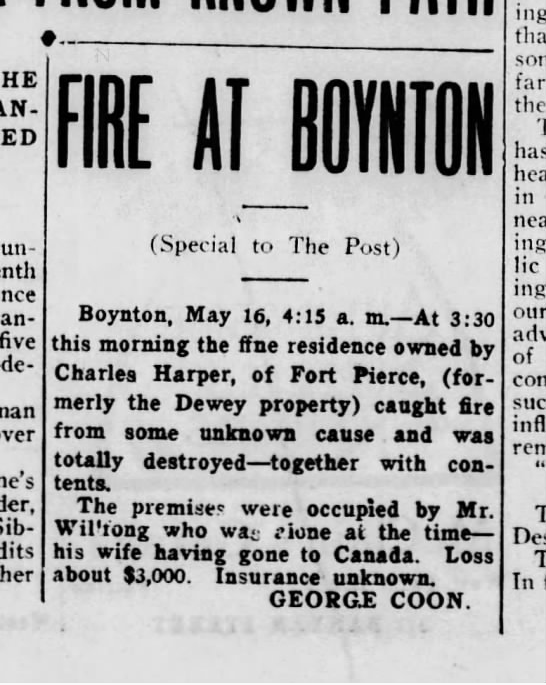 The newly updated Palm Beach Post archive at Newspapers.com revealed that the Dewey house burned May 16, 1916 in the early morning hours. No cause was given.